#ICYMI: HERE’S THE FULL TEXT OF WHAT POLICE IG, IBRAHIM IDRIS ACTUALLY SAID IN ‘DOCTORED’ VIDEO – Royal Times of Nigeria. 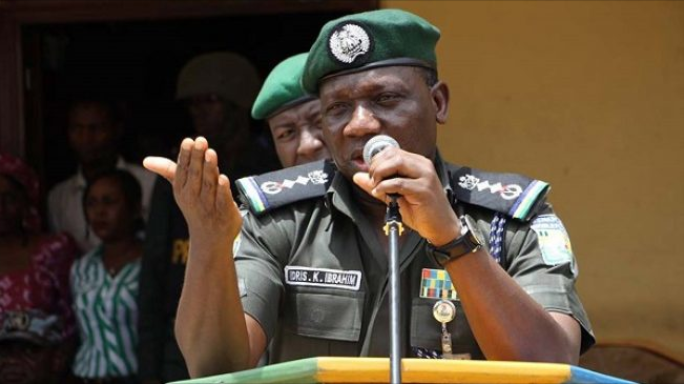 The Inspector General of Police, Ibrahim Kpotum Idris a few days back delivered a speech and he found it difficult to read the script properly as he kept stuttering and repeating some words. The video which appeared to be doctored went viral on Wednesday generated reactions across social media platforms. “…represented by the SSG in Kano state. The Commissioner of Police…, I mean the AIG in chapel… in charge of POLAC (Police Academy) who is here with us this afternoon. The Commissioner of Police in the charge of Kano State Command. The Commissioner of Police in charge of the monitoring unit, Abu Sani, senior police officers in command, ladies and gentlemen. “I am delighted to make this remark at the official…. official commissioning of the cobweb transmission… I mean eh intelligence platform of the federal… I mean of the Kano state Command as it remarks yet another milestone in the… in the efforts of this administration to cul..commission the Nigeria Police Force to make an important, effective and responsive…, a responsive in the art of policing in Nigeria. “On my appointment as the Inspector General of Police on the 22nd June 2016, I promised to make the Nigeria Police Force to a higher level where it will be more accountable, effective and transmission… I mean, transition to available with effective… I mean eh with… I mean sorry… with eh a pro.. I mean eh… apprehensive on corruption to have effective forthfaith… I mean full faith in the commission, I mean transmission, I mean effort, that the transmission cooperation to transmission, I mean transmission to have effect, ehm, apprehend, I mean, apprehensive towards the recommendation, recommended formation effective and effect, I mean, apprehensive at the transmission of crime prevention and detection…and transmission and transmission for the effective of the transmission of the Nigeria Police Force and the men in the command,”. After attempts to get the speech right, the IGP apologised to the audience while signalling to someone for help. Idris continued stuttering despite receiving help from a man in suit, who helped hold the script and also assisted in the pronunciation of some words. “…percent of all kidnapping transmission, transmisison and other effective transmission transmission, other transmission. I can state without fear of contradiction that I have commissioned what?”.